I enrolled for a BSc at the University of Melbourne in 2011. I had a passion for chemistry since I studied it at high school, so I knew I wanted to major in chemistry. I enjoyed working in the lab and completing experiments as part of the practical chemistry subjects in my course. In third year we were provided the opportunity to complete a research project. I found research very exciting and stimulating, so I decided that I would complete an Honours year. I enrolled in a BSc(Hons) and worked with a friendly and supportive inorganic chemistry research group under the guidance of Dr Colette Boskovic. I completed my Honours research project on the structure properties of hybrid-polyoxometalate compounds. I enjoyed learning advanced topics in chemistry and applying the chemistry knowledge gained throughout my studies to my research. After completing my Honours I decided to take some time to relax and travelled for a little while. I began searching for work immediately after returning from my travels and shortly afterwards was contacted by a recruitment agency regarding an analytical chemist role. I was interviewed for the role and was successful. 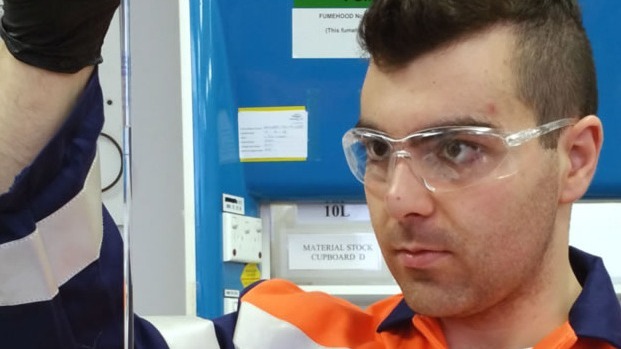 I began work at PPG Industries Australia in 2016. I currently work in a small team of analytical chemists using analytical instruments and techniques to solve various problems for the company. My experience with GC and HPLC in practical chemistry classes provided the foundation for me to learn how to operate these instruments for the analyses I perform in my work. I also regularly employ my skills and knowledge from my university studies to analyse and interpret IR spectra. There is a paint production plant on site and we are often be required to analyse samples from the factory for quality control. Most of the production is for the automotive industry and for automotive refinish, so we are also required to analyse paint samples for Holden, Ford, and Toyota. There are also resin chemists in the research and development laboratories who send us samples to analyse and determine the molecular weight distributions of their polymers. Some jobs are a little more complicated, sometimes involving the identification of a contaminant or unknown material and requiring the use of several analytical instruments including IR spectrometers, GC, and HLPC. Overall, the work is varied, challenging, and interesting.